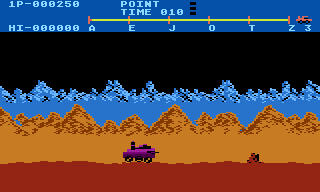 So, looking at Moon Patrol, you can see that the buggy is extremely chunky, in its 2 color pm quad pixel glory! But, I would like to bump up the resolution of the buggy. So, I've been making this mock-up image in gimp, where the wheels are made out of software sprites, at the cost of changing a color register that was a dark brown. Big deal. The body is the only part of the buggy that's a hardware PM (and the windshield to prevent color clash in other areas). So, is this doable? Edited by EnderDude, Sat Sep 1, 2018 9:43 PM. The body looks worse though. 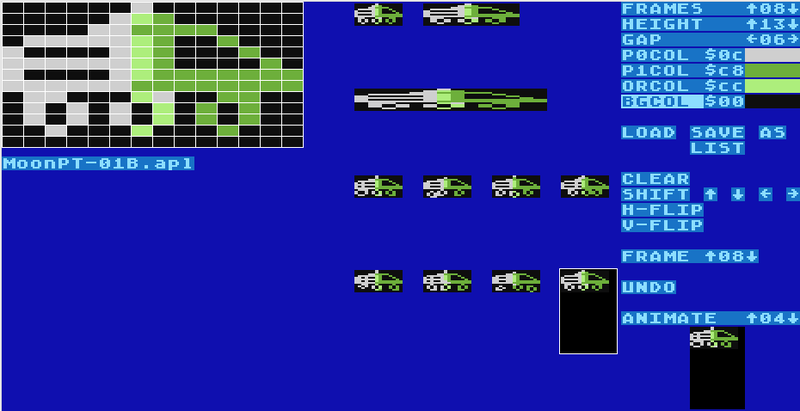 A quick look at the game - there's in fact 16 blank scanlines in the vicinity of the wheels and lower body. So possibly the wheels could be done as softsprites though is that going to help much? I do suspect though that there's probably times like jumping where the wheels would overlap playfield. There looks to be 3 indpendent scrolling areas and the car overlaps at least the middle one and IIRC there's the uphill section where it probably overlaps the lower one. Great idea....but the buggy looks quote a bit too big now, that is...if the background is in perspective ? I've never cared for the buggy in the original either, but not necessarily because of the low res, I think it could be drawn better, even in the low res. An extra color on it and the single colored enemies is desperately needed though. But I hate the buggy pictured above even more. It is too big and is even less like the arcade than the original. Great idea, terrible implementation, IMHO. For one thing, the wheels need to overlap the lower part of the buggy, completely below like it is makes it too tall and just wrong, but the body of the buggy, though I like the colors, is also to tall/big and as I said, even uglier. However I do like the color shading you've done on the lower half of the buggy. Edited by Gunstar, Sun Sep 2, 2018 7:05 AM. This isn't the final design. In fact, I just made it by memory, in one sitting. So don't expect much thought was put into it. Edited by EnderDude, Sun Sep 2, 2018 9:45 AM. If you look at the peak of the y position of the wheels in the original version, they DON'T overlap. Also, looking at the uphill sections, I don't think you can jump, and it looks like there are a lot of blank scan lines. What are the dimensions of the original sprite ? I would love to have a crack at it ! Well, the maximum resolution of any hardware sprite is 8 pixels wide. So you have 8 pixels of resolution to work with. However, you can double or quadruple the pixels to cover more space. I've made another mock-up that should look a lot more like the sprites used in the arcade (including the rock). Can pixels of a color register in the playfield go over pm sprites? Edited by EnderDude, Sun Sep 2, 2018 12:03 PM. 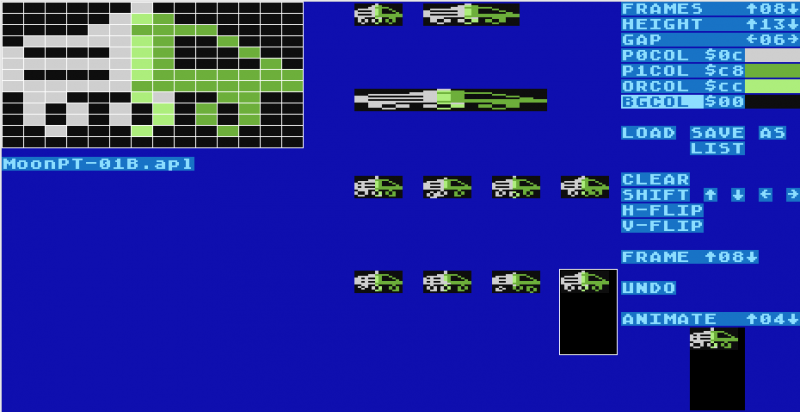 If I could program and redo this game, I'd use all the player sprites to make up the moon buggy, paired side by side for 16-pixel resolution, using a higher resolution like in your latest pic above, then use multiplexed software sprites for the enemies, and missile sprites for the missiles/shots. Here is something to look at - it's not in the right dimensions - and the design is still a WIP - with the animation not so good..
Maybe this will help someone design a better one? Get them thinking - to have a go.... with it. I think the original design for the A8 - was OK - but it could be tidied up a bit more. I didn't like the original design for the coin-op - so I'm all for changing the design of it. Edited by EnderDude, Sun Sep 2, 2018 4:03 PM. So, other than graphics, how would I change the music data to something that's from, for example, rmt? Do I copy a certain part of the sap file into the area for the music or...? Edited by EnderDude, Sun Sep 2, 2018 5:29 PM. Likely the music is by subroutine in VBlank similar to how RMT does it. It might be similar with this game - if that's the case then a stub of code replacing the original routine with translation to what RMT expects. When I do paste random blocks of data from the SAP file (which is a remade version of the song), it doesn't give the intended result. As in, it's a bunch of random notes. So, what do you mean by replacing the original routine with a translation that RMT expects? Is RMT embedded in the SAP file itself? So, let's focus on the enemy ships now. If you DON'T use the 5th hardware sprite, there would be 4 colors available, excluding black, in the area of the ships. That area is ripe for soft sprite opportunity, with 4 registers free! The 5th color is devoted to enemy missiles globally. Vertical player missiles would be hardware missiles, while the horizontal missiles are software sprites. I have a mock-up of this idea as a photo below (even the arcade version of the enemy sprites had a maximum of 3 colors that are all shared!). 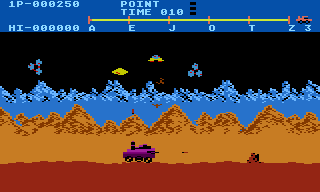 I'm pretty sure that we can make Moon Patrol a lot better on the Atari 8-bit series. Edited by EnderDude, Sun Sep 2, 2018 10:56 PM. I really like this. BITD I thought MP was a good conversion with impressive looking backgrounds but indeed the buggy looked very weird compared to the arcade version. So I hope you will succeed ! By the way, what are the enemy ships in the original, or they PMs ? The game doesn't use RMT, it didn't exist then. So you can't just paste in new music and change a few things. I'm on the position that every change of the game makes it worse. It looks good, the music adds well , and the gameplay has the perfect Arcade touch. 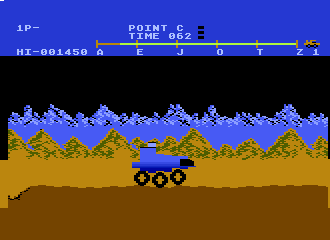 If Moon Patrol would be simple enough to start from scratch, then probably that would be the better way to go. If it's not, you can look at the map of the ROM, then you can disassemble only those parts of the game that can potentially code to give you less of a headache while writing the code for the soft sprites. Edited by EnderDude, Mon Sep 3, 2018 8:04 AM. Thanks, but v4 doesn't have anything different from v1, but v2 just has the 3rd channel clocked by the cpu's clock (1.79 mhz). So, why did they make the PM's so large in the first place? Because that's what was necessary to have the game running at that arcade quality?